The attorney, Scott Talkov, is a litigation associate with the Riverside, California law firm of Reid & Hellyer. In this capacity, Talkov has assisted several media organizations in compelling the disclosure of government documents through the California Public Records Act requests and other motions. This experience, combined with his hobby of home brewing, compelled Talkov to enforce the public’s right to know. Talkov stated that he came up with the idea on Saturday, August 18 after conversing with a fellow lawyer. The next morning, Talkov created a Facebook event inviting friends to a presidential debate watching party in which he promised to serve a beer that attempts to clone President Obama’s home brew. After he began drafting the letter on August 21, his research revealed that another home brewer had filed a similar request, which was reported that same day. That request, apparently written by a non-lawyer, casually requests that the recipe be signed by President Obama. By contrast, Talkov’s request cites case law on the breadth of the the FOIA, hoping that the secrecy surrounding the recipe is replaced by openness in government. Moreover, Talkov’s request is unique in seeking the disclosure of any invoices reflecting the brewing equipment and ingredients that may have been purchased by the federal government, as well as the name of the brewer. Talkov admits that the White House may cite personnel exceptions in rejecting this latter request. However, claims of exemptions for all White House records were rejected in a recent ruling relating to the White House visitor logs. The text of the letter, sent August 21, 2012, is below. An update will be provided when a response is received. I also request that a copy of the documents concerning the following subject matter be provided to me: Any invoices, receipts of other documents reflecting the purchase of any brewing equipment or ingredients purchased for use in the White House from January 21, 2009 to present. I further request that a copy of the documents concerning the following subject matter be provided to me: Any time sheets or other documents reflecting the name of any personnel responsible for brewing in the White House from January 21, 2009 to present. As you are likely aware, so long as the government agency has created or obtained the requested materials, the document is an “agency record” within the meaning of the Freedom of Information Act. (United States DOJ v. Tax Analysts, 492 U.S. 136, 144 (1989).) Such records include all books, papers, or other documentary materials made or received by an agency of the United States Government. (See 44 U.S.C. § 3301; Forsham v. Harris, 445 U.S. 169, 183 (1980).) 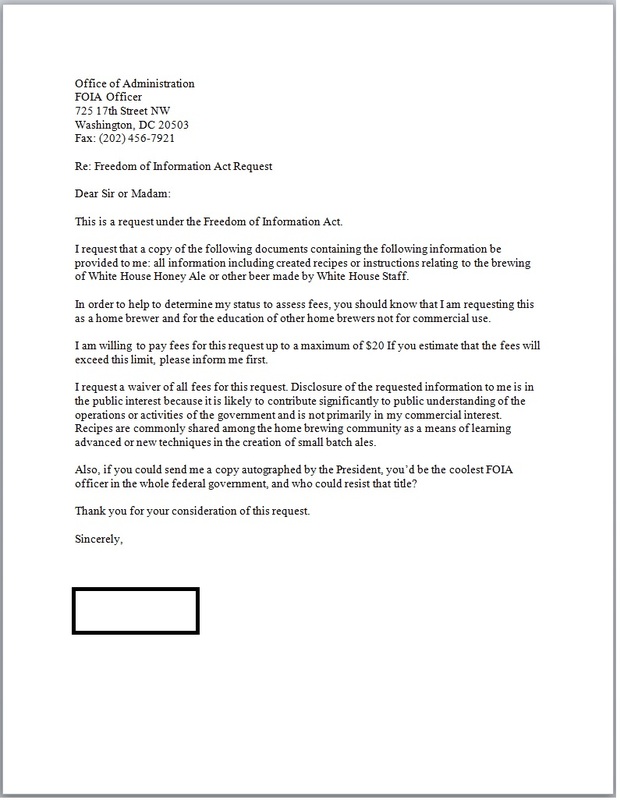 As such, any recipes, invoices, or other documents reflecting brewing at the White House are properly the subject of the Freedom of Information Act. In order to help to determine my status for purposes of determining the applicability of any fees, you should know that I am a home brewer that is seeking to understand the methods, tools and ingredients used by the first beer to be brewed in the White House to improve my home brewing attempts to clone the White House Honey Ale for personal use, in compliance with Title 27 of the Code of Federal Register, section 25.205(a). This request is not made for commercial use. I am willing to pay fees for this request up to a maximum of $100.00. If you estimate that the fees will exceed this limit, please inform me first. I also request a waiver of all fees for this request. Disclosure of the requested information to me is in the public interest because it is likely to contribute significantly to public understanding of the operations or activities of the government and is not primarily in my commercial interest. Specifically, this information improves the understanding of home brewers on the methods used to produce America’s presidential beer. This brewing at the White House coincides with a dramatic increase in home brewing throughout the nation. Accordingly, the White House will be able to educate Americans on the methods used in the production of home brewing. I also include a telephone number at which I can be contacted, if necessary, to discuss any aspect of my request. Headquartered in Riverside, Reid & Hellyer has been serving the Inland Empire for more than 100 years as one of the most respected full-service law firms in Southern California, providing transactional and litigation services in business law, real estate, media law, bankruptcy, and civil rights. The firm’s lawyers regularly counsel mediation or arbitration in lieu of litigation in appropriate matters. They also serve as mediators and arbitrators themselves.